As a family owned business for over 45 years, PERI manufactures innovative formwork and scaffolding technology as well as providing support in all project phases. An important company function is the sales and marketing of an extensive range of plywood and panel products for different requirements and applications. Our head office is situated in Weissenhorn in Southern Germany. Our local sales engineers and professional panel sales staff in their respective subsidiaries and offices around the world are available to share their knowledge and know how in meeting your requirements. We would be pleased to have the opportunity to discuss how PERI can help you with any requirements you have and ensure you are buying the best product at the right price. You can count on maximum commitment, high level of competence and a collaborative partnership. For around 20 years PERI has developed into one of the most successful international providers of panel products. Our product portfolio is tailored to meet our customers needs worldwide. Worldwide our customers are cared for by experienced PERI Sales staff and engineers. There to provide advice and guidance for our wide range of customers. As a local contact, they ensure quick and easy responses and processing of all inquires and orders. In addition our experienced staff provide information on use and maintenance of our products to maximize longevity of the product. We offer our customers a comprehensive product portfolio in both construction and industry. PERI panel products can be used for everything from core of a building through to the roof going on. As well as construction our extensive product range enables us to service many different end uses and applications. Through our close and comprehensive supplier partnerships with leading international manufacturers and an annual consumption in the region of 6000 containers, we are able to offer panel products in each country at a competitive rate for our customers. Through our extensive logistic and sales network supported by local stock we can ensure reliable and constant supply. 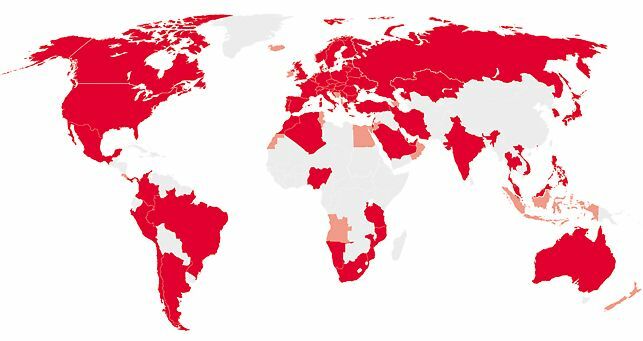 With more than 60 subsidiaries, a large number of branches and over 120 efficiently-run storage facilities, we are close to customers and projects worldwide. provided by locally-based experienced specialists who find the right product to meet your requirements. through a highly efficient logistics network with international ocean and land-based storage locations in close proximity to the customer. with the most suitable product for every requirement – in a full range of thicknesses, sizes, qualities and coatings. through consolidation of international volumes. through strict guidelines in the selection of our suppliers and regular supply chain audits. through environmentally, socially and economically-sustainable activities, e.g. FSC® and PEFC certification of PERI plywood and panel products sales activities. through continuous progress and optimization of products and services. 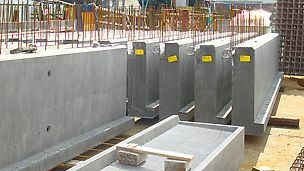 Robust and durable production pallets are essential for the manufacture of concrete blocks. 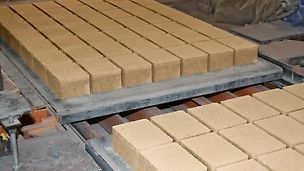 PERI Pave production pallets provide a flat surface during the production process and, due to the stable multiplex structure, a very high load-bearing capacity during the storage procedure for drying the blocks. In spite of its high stability, the pallet has a low own weight. The crosswise bonding of the individual veneers ensures a high and uniform transfer of vibrations. This results in not only good concrete compaction but minimizes energy use at the same time. The PERI Pave production pallet is coated on both sides with a plastic laminate. This joint-free and easy to- clean surface provides a smooth reverse side of the block and also allows problem-free use for the production of washed concrete stones. 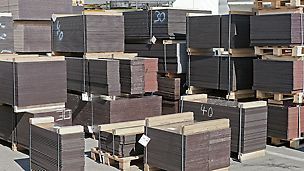 Furthermore, the coating prevents any leakage of the wood constituents and thus discoloration of the concrete blocks. Through customized CNC processing, the PERI Pave can easily be adapted to all machine types. 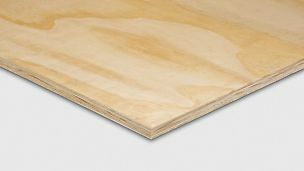 Plywood panels are used in various parts of the vehicle production process, therefore different characteristics are required for each. For vehicle floors, wear and slip resistance is very important for both commercial vehicles and trailers as well as for railway carriages and boat decks. PERI wiremesh plywood is the right choice because the non-slip surface pattern ensures good slip resistance and is also resistant against abrasion. PERI offers different types of surface productions, which are all weather resistant, easy to clean and resistant to chemicals. This prolongs the service life and reduces operating costs. PERI Maxi panels with structured surfaces allow the production of large, joint-free vehicle floors. 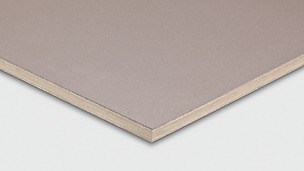 For vehicle sub-constructions, uncoated plywood from the PERI range is used. For the interiors, smooth, coated panels are ideally suited which also provide optically high-quality surfaces. Customized constructions and sizes give the manufacturer the freedom to use it in different types of chassis. The plywood panels used in vehicle construction are easy to process on CNC machines but at the same time are so robust that tongue and groove joints are possible as well. 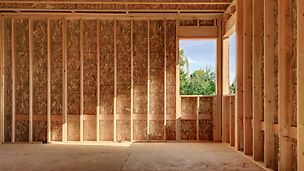 In timber frame construction, structural plywood and OSB panles are primarily used. Important characteristics are dimensional stability and exact accurate tolerances of the utilized panel product. For constructional purposes, such as walls, floors and roofs, PERI offers a full range of panel solutions. Our wood panels can be used both constructive as well as decorative applications. They can be easily machined and are characterized by their low weight. All PERI products that are used in this field of application are CE, FSC® or PEFC certified, and also comply with other country-specific standards. For on-site concrete applications the panels are exposed to a number of stresses. In addition to environmental influences, the handling and storage of the panel before and during use can have a decisive influence on the life and performance of the product. 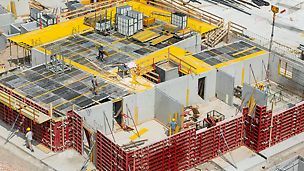 The number of formwork uses along with the demands regarding the concrete surface quality vary from project to project, and provide two important factors in choosing the right panel. Through our vast experience PERI is able to offer sound solutions in the construction industry with regard to the different surface finishes, wood types, thicknesses and panel sizes required to meet our clients demand. All our formlining panels are characterized by a robust core panel for consistent dimensional stability, whilst maintaining a relatively low dead weight. In addition good workability and lifespan is ensured with the correct handling and use of our panels. If required, a particularly abrasionresistant coating provides a high number of re-uses. 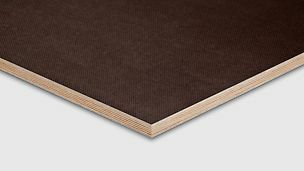 In order to achieve large and joint-free surfaces, we offer special formlining sizes, so-called Maxi panels. But also for secondary operational purposes, our product range includes inexpensive alternatives. The production of precast concrete elements is very complex and ranges from constructive prefabricated construction to the manufacture of single components. Due to the wide varity of formork panels, PERI offers optimum support for any requirement in precast plants. Similar to on-site construction, the plywood for precast products features high stability and dimensional accuracy as well as a high-quality core with a hard-wearing and smooth surface. This facilitates multiple utilization and makes a significant contribution to the final concrete finish. 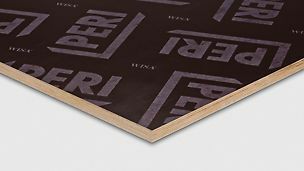 For large, joint-free concrete elements, PERI provides a full range of Maxi panels in different thickneses and formats. The easy workability of the panels makes it possible to produce individual precast forms in a short time at low cost. For support structures, the high strength and dimensional stability of the panel is decisive. 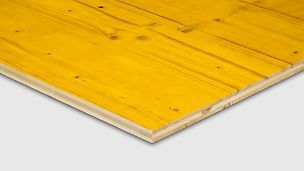 For this, a wide range of coated and uncoated plywood products is available. 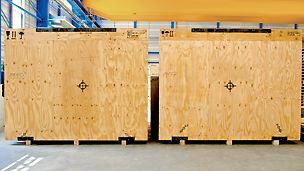 Panels used as industrial packaging for valuable goods are characterized by its high strength and low weight. Due to their construction, panels are ideally suited for packaging of any type. It is particularly light and, at the same time, meets the high requirements regarding strength and dimensional stability. In addition, it can be easily machined and thus adapted to suit a wide range of packaging sizes. If the focus is on ensuring low weight products softwood panels are the best solution. If a more sturdy packaging is required, then hardwood plywood such as birch is recommended. Also in this fields PERI offers a full range of panels. PERI panel products are available in many qualities and standards. Panel thicknesses, sizes and coatings are adapted to suit local market requirements. On request, we offer CNC-machined and individually tailored solutions. Experts for panels in the different countries provide support for the best solution. Sustainable management is a fundamental principle of PERI. As a result, we source our plywood and panel products from manufacturers that process timber only from legal sources and, as far as possible, from certified, sustainably managed forests. 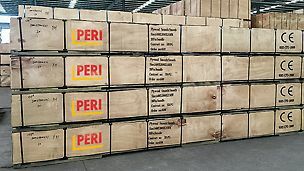 The product chain (Chain of Custody) of PERI GmbH is certified according to the standards of the PEFC and FSC®. PEFC (Programme for the Endorsement of Forest Certification Schemes) and FSC (Forest Stewardship Council®) are non-governmental, non-profit organizations. They are committed to sustainable forest management and certified forests which are managed according to these criteria. Sustainability means that the forest management must not only be environmentally sound but also socially acceptable and economically viable. 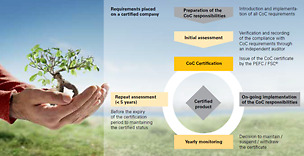 Many PERI subsidiaries are already certified or are currently going through the certification process. Everyone like PERI who sells products made of wood from certified growing regions may make this clear on the end product by attaching the PEFC or FSC® logos. The prerequisite is that a due diligence system is introduced that covers the entire product chain – from procurement and storage through to the sale. Compliance with the requirements is reviewed annually while certification is renewed every 5 years. Thus, our customers can be sure that the wood for PERI products which carry the PEFC or FCS logo does come from sustainably managed forests. As an importer of products, PERI GmbH uses the due diligence system of the General Association of the German Timber Trade. This system is subject to technically- based monitoring and constant external supervision by the Federal Agency for Agriculture and Food (BLE) as a public authority. 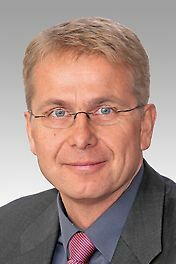 It is based on the minimum requirements of the European Timber Trade Federation (ETTF), which prescribes harmonized due diligence for the European timber trade federations. PERI confirms that the traded goods have been subjected to due diligence according to the standards and in accordance with the requirements of EU Regulation 995/2010 (Timber Trade Regulation).